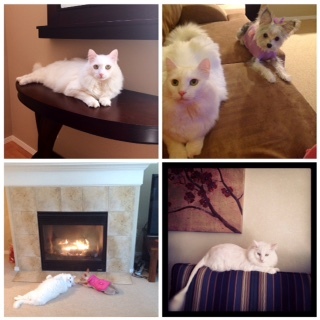 Looking for a fur ever home for my 9 year old neutered all white cat named Gus. Divorce forces me to rehome him as I already have two small dogs and my future rental will only allow for that. He is declawed in front, recently had rabies vaccine and no current health problems. I do keep him on a urinary tract food made by pro plan because several years ago he had a U.T.I that showed crystals in his urine. I guess it can be common in male cats. He is mellow/easy going when in a relaxed environment but at the vet is mean and will bite. He may take a little bit to warm up to someone. He’s used to dogs, other cats and even farm animals but I’m not sure how he would do with small children. He’s a come to you when he wants kind of cat. will include food, crate, unlimited food feeder and anything else I have left over. Need to find new home by August 15th as that is when I’m moving. My contact info is Jessica Chisman 971-227-8596.